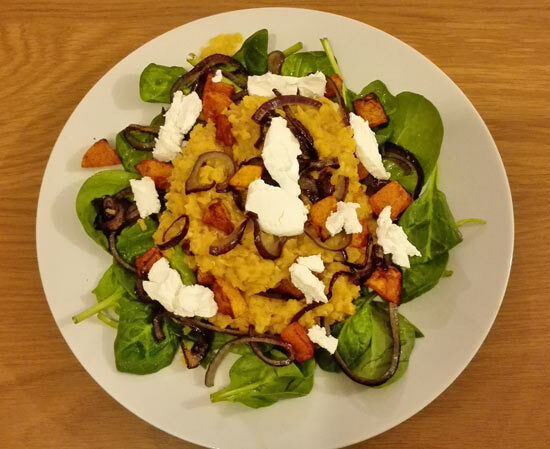 This week is National Vegetarian Week so I wanted to share with you some of my favourite vegetarian meals which are quick and easy to make. 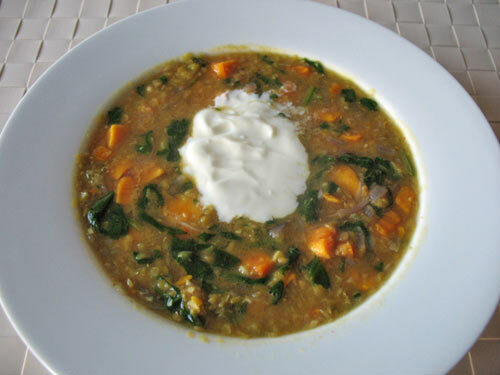 The recipes I am sharing here are the ones I love – they are delicious, nutritious and healthy! Many of them I eat weekly either for dinner or lunch. 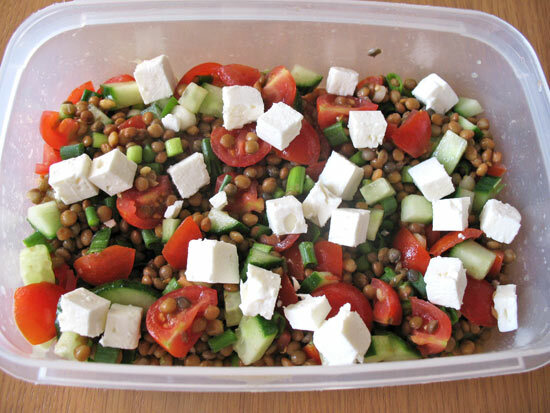 You will find some meals are more suitable for healthy lunch at work while others make an easy vegetarian dinner. Remember that eating more vegetarian food is better for your health and environment so why not get inspired here and include more vegetarian meals in your diet this week? 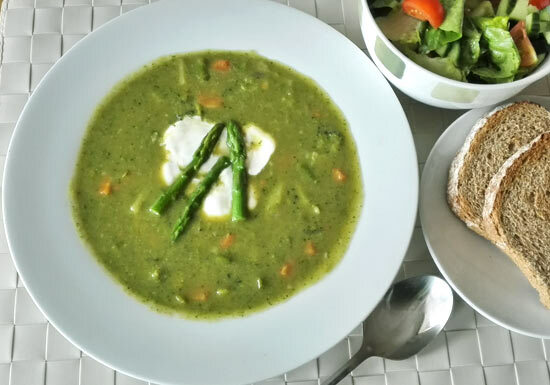 Since I created this recipe I make this asparagus soup weekly (it’s asparagus season so you should make use of it!). I LOVE this soup but the key is to blend it at the end to make it smooth so all the flavours get mixed together. Also, add a dollop of greek yoghurt on top when serving and you will have a winner. I’ve tried this soup with carrots as well and this also works well. You can put less broccoli if its flavour is overpowering and less sweet potato or carrots if you think it’s too sweet. Experiment to find the right balance for you. 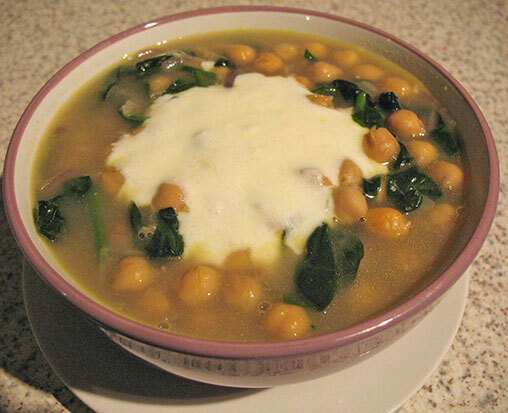 This soup is really quick and easy to do so if you try one recipe from here you should definitely try this one. I created this dish as I was bored of lentils and I was really happy how it turned out at the end. 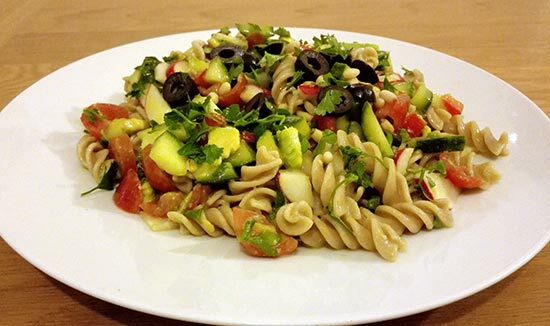 In this salad I used organic wholegrain spelt pasta and a combination of delicious vegetables. This vegetarian dish is great for healthy lunch at work or easy vegetarian dinner. 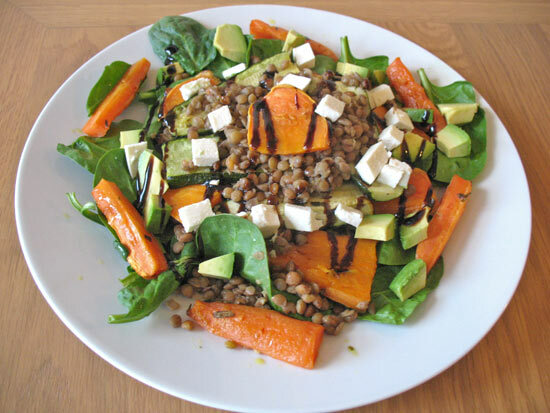 This is the first time I made a warm red lentil salad and it turned out great! All the ingredients work very well together, creating this delicious and nutritious vegetarian meal. It makes a great vegetarian dinner which is really filling. Who doesn’t like good old fashioned pizza? Luckily, pizza can be easily made vegetarian and healthy at the same time. 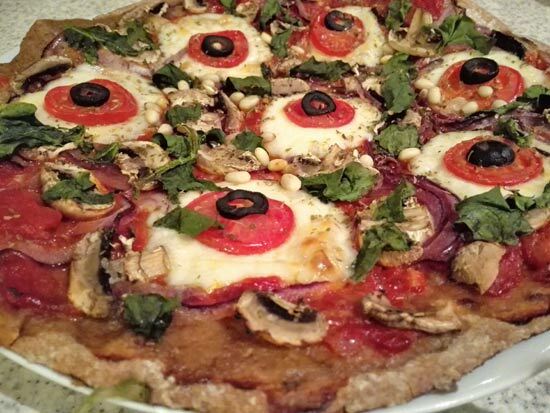 I made it healthier by using artisan wholemeal pizza base from Dough It Yourself and low fat cheese. If you have time you could make the base yourself – I did it once, but OMG it is so time consuming and next time I’d rather buy it. Avoid using white dough as it contains less fibre, vitamins and minerals. 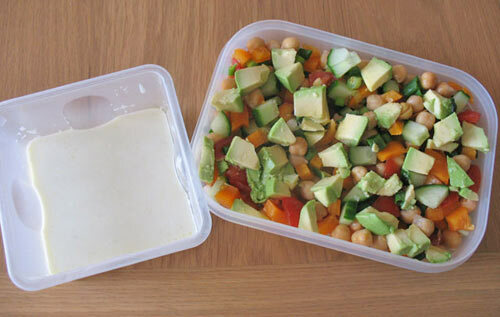 This chickpea salad is one of my favourite lunches for work. I don’t always put exactly the same vegetables in it, sometimes I may have something missing but the key ingredients are garlic, onion, tomatoes and yogurt. I love it with avocado and adding sweetcorn also works very well. 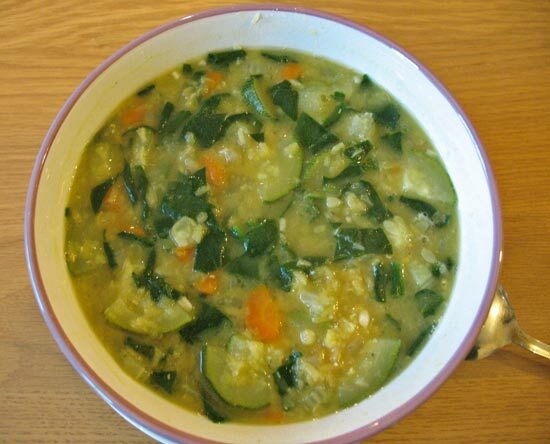 This soup is one of my favourite soups. I just love this combination of vegetables, it’s so delicious! Try and get organic bunched spinach if you can as it tastes better. Egg and avocado is a match made in heaven I believe. 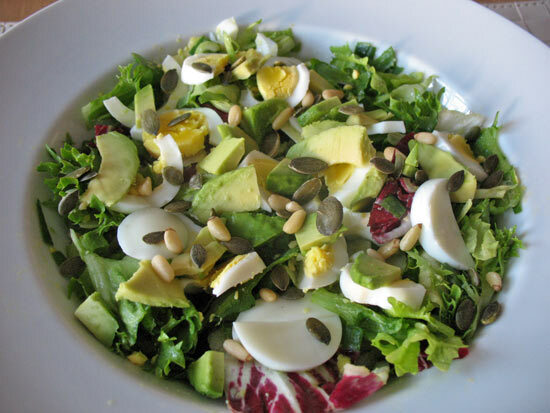 I made this salad when I was in a mood for experimenting and it came out really delicious. You can add some feta cheese on top to make it more filling. Serve it with wholegrain bread. Quinoa salad is another type of salad I eat all the time. 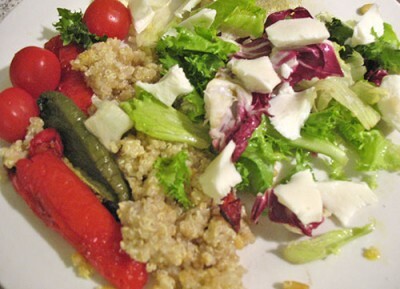 It makes a great lunch for work, just cook the quinoa and roast the peppers the day before. I normally prepare it in the morning before I go to work but I add the olive oil, salt and lemon juice just before I eat it. This is something my boyfriend made for me once and since then I started making it regularly as I really liked it. I make it my own way and it’s quite filling vegetarian dinner. Roast a tray of vegetables of your choice and cook lentils to create this filling vegetarian dinner. Will you be cooking more vegetarian meals this week to celebrate National Vegetarian Week? What is your favourite vegetarian dish? Thanks Helen! If you try any of those recipes I really hope you like them. WOW ! Yummy food s !